The most expensive new book on sale in Catalonia on the Day of the Book is the first of three volumes of the Bible of Saint Louis, a lavish reproduction of a 13th-century manuscript preserved in Toledo Cathedral. Containing more than 5,000 illuminated story illustrations, the original was commissioned by the mother of the King of France and created, between 1226 and 1234, by Guillaume d’Auvergne, a professor of theology and Bishop of Paris. Scenes of life in the Middle Ages are brought to vivid reality by its colourful images. The new version of this Bible has been produced by Manuel Moleiro, a Barcelona publisher, who goes to astonishing lengths to replicate the look, the feel and the smell of the originals, even to the extent of reproducing the flaws such as blots, wax stains and scratches. If the Internet is at the forefront of communication, foreshadowing the end of the printed book, then the M. Moleiro publishing house is cheerfully at the opposite end of the spectrum. “We take pride in combining the most advanced contemporary graphic and printing technology with the precision of specialists in medieval art and handcraft work,” says Señor Moleiro. Experts in the study of codices and medieval miniatures select the natural inks, melanins and hides which best replicate the originals. A team of craftpeople make, by hand, the paper and parchment using traditional techniques. 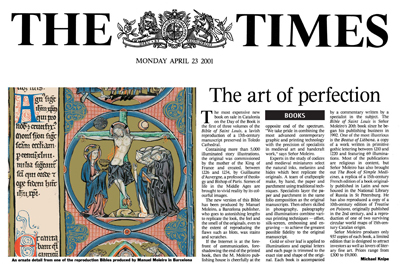 Specialists layer the paper and parchment in the same folio composition as the original manuscripts. Then others skilled in photography, paleography and illuminations combine various printing techniques – offset, silk-screen, embossing and engraving – to achieve the greatest possible fidelity to the original manuscript. Gold or silver leaf is applied to illuminations and capital letters and each page is trimmed to the exact size and shape of the original. Each book is accompanied by a commentary written by a specialist in the subject. The Bible of Saint Louis is Señor Moleiro’s 20th book since he began his publishing business in 1992. One of the most illustrious is the Beatus of Liébana, a copy of a work written in primitive gothic lettering between 1210 and 1220 and featuring 69 illuminations. Most of the publications are religious in content, but Señor Moleiro has also brought out The Book of Simple Medicines, a replica of a 15th-century French edition of a book originally published in Latin and now housed in the National Library of Russia in St Petersburg. He has also reproduced a copy of a 10th-century edition of Treatise on Poisons, originally written in the 2nd century, and a reproduction of one of two surviving circular world maps of 15th-century Catalan origin. Señor Moleiro produces only 987 copies of each book, a limited edition that is designed to atract investors as well as lovers of literary fine art. Prices range from £300 to £9,000.